Amazing Magic Coin Trick To Baffle Your Friends and Make Your Reputation! "Do You Want To Get Your Hands On The Secret To A Stunning Magic Coin Trick That Will Truly Amaze Any Audience?" 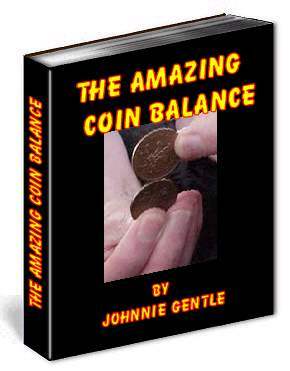 "The Amazing Coin Balance! - - It Will Astound Everyone! magine the scene. - You borrow a couple of 2 Pence (UK 2p) coins and proceed to balance them after a little trial and error. - This is a great feat in itself and no matter how hard the audience members try, - it's pretty impossible. However, imagine their absolute astonishment when You TURN THE COINS OVER AND THEY NOT ONLY "BALANCE" BUT "SPIN" ON ONE ANOTHER. This is so impossible and stunning that it really blows audience's mind! - IT NEVER FAILS! This Amazing piece of Coin Trick Magic can be done anywhere, with just two borrowed Coins - UK 2 pence Coins are ideal. There's NO Sleight of Hand or fancy moves. There's no preparation and you can even borrow the coins in certain circumstances. All that's required to perform this stunning coin magic trick is a simple little Secret. This just seems Impossible and astounds the audience. You'll use this card trick everywhere you go. Don't miss out on the chance to get your hands on this Stunning Feat of Magic! CLAIM YOUR FULL INSTRUCTIONS NOW!